This Carlisle PS801B00 Storee N' Pour assortment contains six 1-gal. containers, six necks, six spouts, and six caps, for use in a bar or restaurant for preparing mixed drinks. 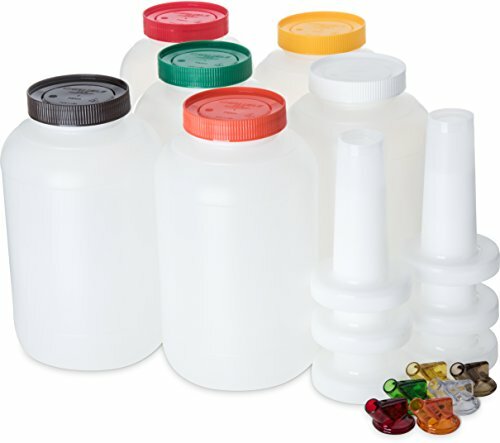 The containers, necks, spouts, and caps are made of polyethylene, which resists impacts and certain chemicals. For pouring, the spout snaps to the neck, and the neck screws to the containers for Storeage, the cap screws to the container. Seals between the containers, necks, spouts, and caps help prevent leaks. A ridge around the outside rim of the cap allows containers to be stacked on a shelf for Storeage. The straight walls of the containers and necks and the rounded shape of the spouts and caps facilitate cleaning. This color assortment includes red, green, yellow, orange, brown, and white for identifying the container's contents at a glance. Each unit measures 16.47" in height, 5.97" in diameter, and is dishwasher-safe. Carlisle manufactures food service equipment and supplies and sanitary maintenance tools and supplies for commercial, industrial, and institutional facilities. The company, founded in 1954, is headquartered in Oklahoma City, OK.